CML members are adopting a new statement of practice on buy-to-let mortgage lending ahead of coming regulation of consumer buy-to-let products by the Financial Conduct Authority (FCA). Council of Mortgage Lenders members are adopting a new statement of practice on buy-to-let lending, designed to provide clarity about how responsible buy-to-let lenders operate. The statement reflects existing good practice and gives a clear explanation of the obligations of buy-to-let borrowers on their mortgages. It gives landlords additional information from other organisations about the responsibilities of being a landlord, and has been endorsed by the Residential Landlords Association, the Association of Residential Letting Agents, the Association of Mortgage Intermediaries, the Intermediary Mortgage Lenders Association, and the British Bankers Association (BBA). So far thirty-one lenders representing an around 90% of the buy-to-let lending market have adopted the statement of practice. 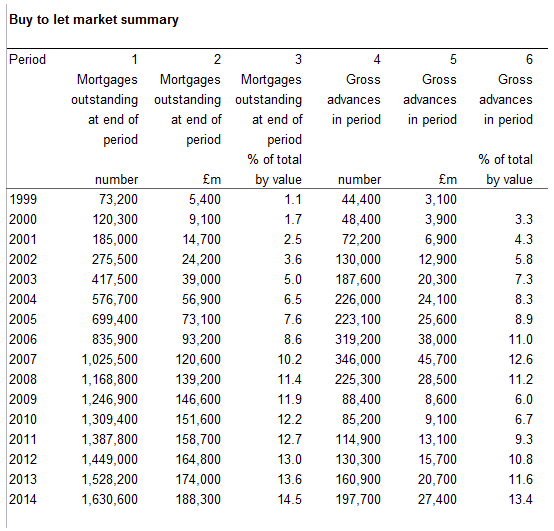 It is expected that all CML members offering buy-to-let mortgages will adopt it during 2015. 1 – Mortgages regulated by the FCA like residential mortgages. These are when the property is either partly occupied by the borrower or let to an immediate family member. 2 – Mortgages regulated by the FCA under the Mortgage Credit Directive Order 2015. These are “consumer” BTL as defined by the Order. 3 – Mortgages not regulated by the FCA. These are mortgages which are predominantly for a business purpose. The statement of practice will cover any residential buy-to-let lending not then covered by FCA regulation.